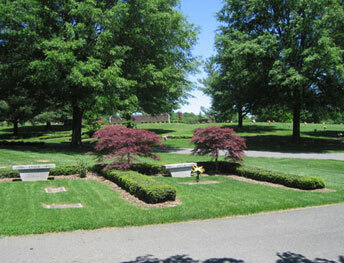 Fairfax Memorial Park, serving Fairfax and all of Northern Virginia, is a family owned and operated cemetery, established in 1957 by Cornelius H. Doherty, Sr. The family tradition, now in its third generation, continues under the leadership of his grandson, Michael H. Doherty. The ideals of this family tradition have been handed down and are expressed by the compassionate and professional assistance of our Family Services Counselors. The serene, natural beauty of this 128 acre cemetery is enhanced by artful landscaping and statuary, ever welcoming family and friends to linger and reflect upon precious moments shared with loved ones who now rest here peacefully. Within this comforting sanctuary we offer a variety of Personal Choices at affordable prices and discounts on pre-need purchases. Perpetual Care insures protection of the cemetery's beauty for future generations. In our idyllic setting, stately trees punctuate the lush green lawn. Blending harmoniously into this natural setting are numerous theme gardens with featured statuary. Flush lawn-level bronze memorials mark traditional in-ground sites while mausoleums, columbaria, personal family side-by-side crypts, family gardens and family estates add to the variety of personal choices available. Click here to request to receive additional information on personal choices available at Fairfax Memorial Park. Our counselors are available seven days a week to provide compassionate, professional assistance to grieving families. Individuals with the foresight to make arrangements for themselves will appreciate the low key philosophy of our organization, and will enjoy the advantage of 10% discounts and extended payment plans...benefits available only to those who purchase before need. Of importance also is the peace of mind gained in knowing that their loved ones are shielded from the burden of making these decisions under duress and without their guidance. Click here to request to receive additional information on available discounts. Families can easily commemorate special occasions by arranging to have either real or silk flower bouquets placed on their loved ones' graves by using the flower shop available on our Memorial Park website. Our location, just outside the city of Fairfax at the corner of Braddock and Burke Station Roads, makes us accessible to all of Northern Virginia and the D.C. Metropolitan Area.